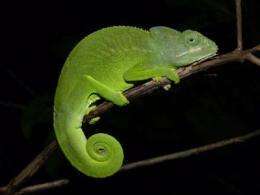 This is a male Mayotte Chameleon (Furcifer polleni), endemic to the island of Mayotte, Comoros. Credit: Oliver Hawlitschek 2010. Organisms living on small islands are particularly threatened by extinction. However, data are often lacking to objectively assess these threats. A team of German and British researchers used satellite imagery to assess the conservation status of endangered reptiles and amphibians of the Comoro archipelago in the Western Indian Ocean. The researchers used their results to point out which species are most threatened and to define priorities for future protected areas. The study was published in the open access journal ZooKeys. A typical problem in species conservation efforts, particularly in tropical regions, is the lack of information on the extent of suitable habitat available for threatened species. "The analysis of satellite images allows us to precisely estimate the remaining extent of rainforest and other natural habitats," says Oliver Hawlitschek from the Bavarian State Collection of Zoology. This approach has rarely been used in species conservation, and this is the first time that it is applied to all species of a group in an entire country. 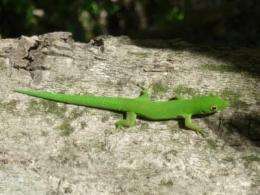 This is an Anjouan Day Gecko (Phelsuma v-nigra anjouanensis), endemic to the island of Anjouan. It also inhabits human-modified habitats. Credit: Frank Glaw 2010. In addition to their satellite imagery analyses, the researchers conducted intensive field surveys in order to detect the habitat preferences of the reptiles. "We found that only 9% of the island area is still covered by natural forest, but many native species have adapted to habitats under human influence like orchards, plantations, and gardens", Hawlitschek says. "Those species which are dependent on the remaining natural habitats are the ones most threatened by extinction". This research was conducted in collaboration with Bristol Conservation and Science Foundation's (BCSF) project in the Comoros. "This collaboration has provided an exciting piece of research for the Comoros. Our project will be using this knowledge and data in combination with our research on birds, reptiles, butterflies, and species of conservation importance to guide our conservation actions which are working towards protecting the remaining forests and threatened species of Anjouan", says Katie Green, Head of Ecological Research and Monitoring, BCSF. Today, rainforests on the Comoros are largely restricted to higher mountains. Credit: Oliver Hawlitschek 2010. The researchers chose the Comoros as a case study for their methodology because, in relation to large islands like neighbouring Madagascar or continental regions, these islands cover little area and are inhabited by a limited number of species. However, they hope that their methods will also be applied to other areas, where more threatened species are concerned. "Natural habitats are destroyed at a fast pace in many regions of the world", says Frank Glaw, herpetologist at the Bavarian State Collection of Zoology. "We therefore need tools to assess quickly and objectively where we have to set our priorities in species conservation, especially for species endemic to small islands which are particularly vulnerable to extinction."